Home - Anglian Customer Contact Centre names East Anglian Air Ambulance as their charity of choice. Anglian Customer Contact Centre names East Anglian Air Ambulance as their charity of choice. In 2009 the Anglian Home Improvements National Customer Contact Centre has pledged to raise funds for the East Anglian Air Ambulance throughout the year. Monthly fundraising events will all contribute to a providing funding for an essential emergency service in East Anglia. “Since its foundation in 2000, the charity has expanded to provide a 365 day a year service covering the 5,500 sq. miles of Cambridgeshire, Norfolk, Suffolk and Bedfordshire. 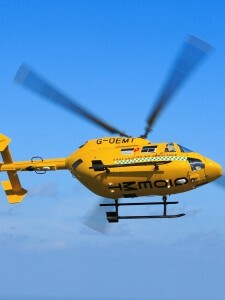 It is now the third busiest air ambulance in the country flying an average of 4 missions per day. It’s our job to get patients to hospital within the “Golden Hour”, and in an air ambulance that journey will take only minutes, greatly increasing patients’ chances of making a full recovery. Here in East Anglia we need an air ambulance more than ever. Our roads are getting increasingly congested, leading to ever more road traffic accidents – which already make up more than 50 of our work. We are considered one of the most rural areas in England with accidents occurring in remote locations not easily accessible by land ambulances. Two world leading rescue helicopters, and back up, provide 360 degree access, allowing paramedics to do much more lifesaving work while airborne. Furthermore, additional space allows the passage of ‘walking wounded’ or perhaps a family member to hospital with a patient, something which is particularly important when children are involved. The equipment is expensive, and running costs are high. However it equates to less than £1.50 per person per year for the population of East Anglia. Receiving No Government or National Lottery funding, the charity relies solely on donations from the public, therefore we are extremely grateful for donations from companies like Anglian Home Improvements”.